The Best Western Gatwick Skylane Hotels newly refurbished restaurant offers an excellent choice of both food and drink. Set in modern surroundings with hints of 17th century grace including original oak beams and an original Inglenook fireplace, the Watershed provides a truly original setting for dinner. At the Watershed Restaurant you can enjoy A la carte or Table D’hote dining with a special daily selection of hot and cold desserts on offer. Dishes on our menu reflect our attempt to make your stay as comfortable as possible and as a result we offer a range of cuisines to suit all palates. 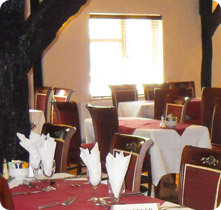 Our house speciality is a selection of homemade authentic Indian dishes. We aim to please our guests therefore if you have any special dietary requirements please inform our staff who will be happy to help. Now with big screen TV on show, the Watershed Restaurant is the perfect place to relax, watch some sport and enjoy a good meal. The Watershed Restaurant is open every day from 6pm to 9.45pm.